Most of us have lost their mobile during traveling or sometimes mobiles are stolen. 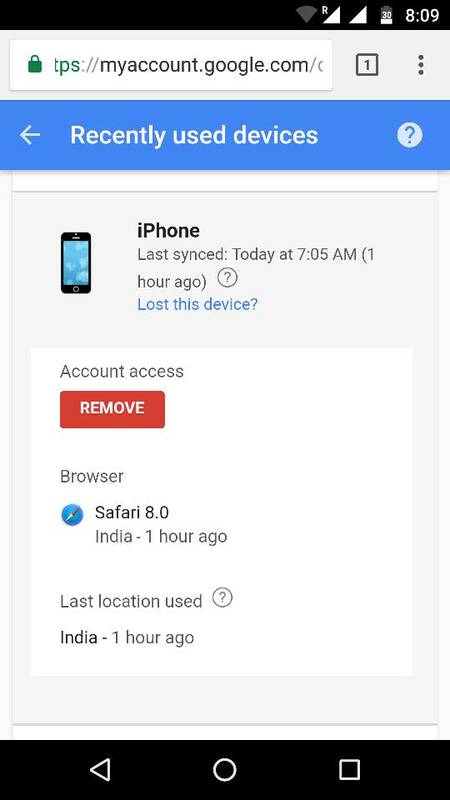 So, it’s important for you to secure your mobile because your device is logged into your Google Account, which anyone can use to access from the stolen device. The thief can access your Gmail, Contact list, Google Drive and all other services which are linked to your Google Account and damage you a lot. But what if your devices are already stolen. How to be safe and stop access to Google Account from stolen devices. Google is provided the solution of this in Manage Account Security Settings to increase your safety. Step 1. Sign in your account using a mobile browser. Now click on icon . It will show you Account Information. Step 2. Click on My Account buttons. It will open myaccount.google.com which contain all the details of your account. Step 3. Now Click on Device activity & notification under Sign-in & Security Section. Step 4. At the bottom of the Recently used device, you will find Review Devices. Click on it. Review Devices will show you all the devices that have been active on your Google Account or currently signed in. Step 5. Now click on the device you have lost. it will show you Remove button. Click Remove. That’s it. You just have removed the access to the device you have lost.